The heat gun has been the tool of choice for the past few days, but I haven't yet reached a point that's worth writing about, so we'll talk about the paint scraper instead. This winter has been terrible in many respects, and the incredible and prolonged dryness has done a number on things like our woodwork and paint. Most of the first floor got a quick paint job with gloss white (walls/ceiling/woodwork) some point before it was listed for sale. 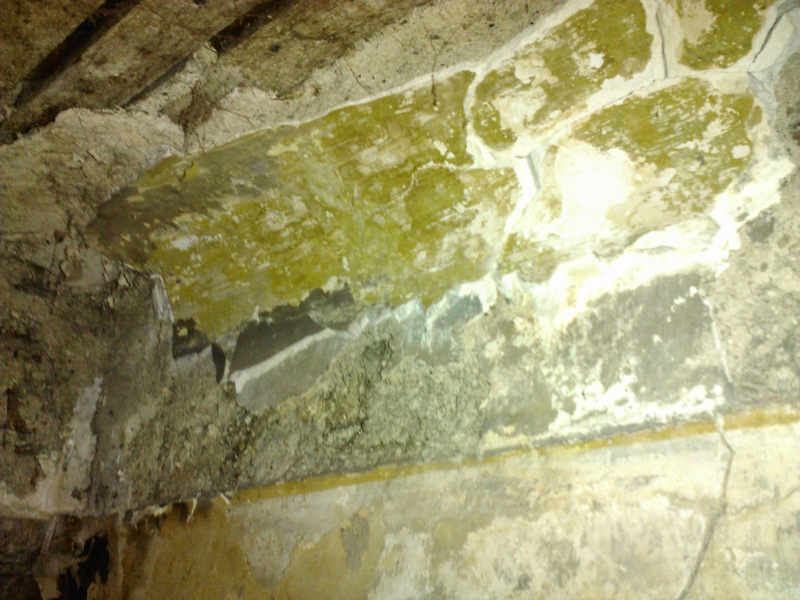 None of the walls were prepped (they were covered with grime and wallpaper paste), and no primer was used, which, paired with the stresses of construction and habitation has resulted in paint cracking and flaking. I won't complain, it all needs to be stripped anyway, and doing so has revealed some pleasant surprises. This section of paint was helped by a massive leak from when we started reconnecting radiators. 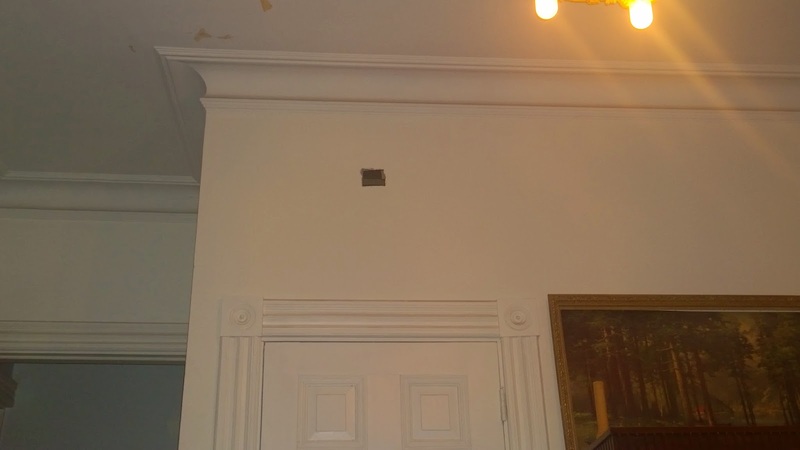 It reveals that there was some decorative painting on the ceiling, bordered by some sort of trim (we can see the patched nail holes) and likely wallpaper over the cove which would have extended to the picture rail (also long gone). The brown of the ceiling is somewhat of a conundrum as the original section of the dining room ceiling above the now-bathroom's dropped ceiling appeared to be navy blue with a painted mosaic pattern around the edges (pictures were on the stolen camera, and the drop ceiling has since been patched). The brown that was revealed may just be the background of the mosaic, I'll need to open up another section to know for sure. Of course this just piqued my curiosity about our other first floor ceilings (all those on the second and third were originally wallpapered). The current entry room/library has 1/4 inch drywall up, so that will remain a mystery. I can tell that the cove of the molding in there was wallpapered since the adhesive was still there after I scraped the paint away. The old entry was mostly gutted when the house was converted into apartments, so I doubt anything would have survived if even the plaster moldings were removed. The section of molding that was clinging to life above the added closet was painted a bronzy green. That leaves the (used to be) front parlor/living room. So this means that this room had already been redecorated by the time the house was split up. It's likely that this was done by the second owners (Escher), who were also responsible for some other lovely arts and craft papers in the house. What this 4 foot section of wall does reveal is that it is original, and has intact molding which is important to know for when we take out the closet. The opening you seen to the right is above the ceiling of the first floor bath (carved from equal parts of the dining room and living room).